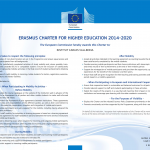 Erasmus (2014-2020) wants to improve the quality of vocational training in Europe, offering students and teachers who teach courses of professional training opportunities mobilitat learning, to study and internships abroad. The Institute has Vallbona Charles Erasmus Charter for Higher Education. Interviews students admitted Intermediate Vocational Training. Interviews students admitted to higher level training cycles. Students admitted and excluded Intermediate Vocational Training. Students admitted and excluded Higher Grade Vocational Training.